As part of the Play Clean Go campaign, SSISC worked with BC Parks to have information signs and boot brush stations installed at 3 popular local trailheads. SSISC recently found Purple Loosestrife in the Squamish Estuary, and used a press release to invite the public to be on the lookout for the plant and speak up if they spot it. You can read the Squamish Chief article here. The Wellness Almanac, a community publication for Pemberton, Lil’wat, SLRD Area C and N’Quatqua, recently featured the Clean Drain Dry messaging. SSISC’s very own Micaela Anguita was recently featured in a Naturespeak article in Pique Newsmagazine. The article dug deeper into what makes some plants, like burdock, invasive, as well as their impacts. She pointed out that burdock has taken over much of Whistler, and it is particularly abundant along the edges of the Valley Trail. Pique Newsmagazine recently wrote about Whistler’s Worst Weeds, the information campaign that SSISC runs to educate Whistlerites about 5 high-stakes weeds to be eradicated. Pique Newsmagazine recently reported that SSISC had secured a two-year grant worth $116,000 from the Ministry of Forests, Lands, Natural Resource Operations and Rural Development as part of a province-wide effort to manage the spread of invasive plants across the province. Bugs Battle Invasive Plants Take a look at this week’s Pique Newsmagazine to read an article about biocontrol agents and the invasive plants they suppress, written by our very own Breanne Johnson. Sea to Sky Invasive Species Council has been sampling local lakes on top of typical summer duties Take a look at this week’s Whistler Question to read an article about SSISC’s invasive mussel sampling program and other activities. By Alyssa Noel. August 7, 2017. 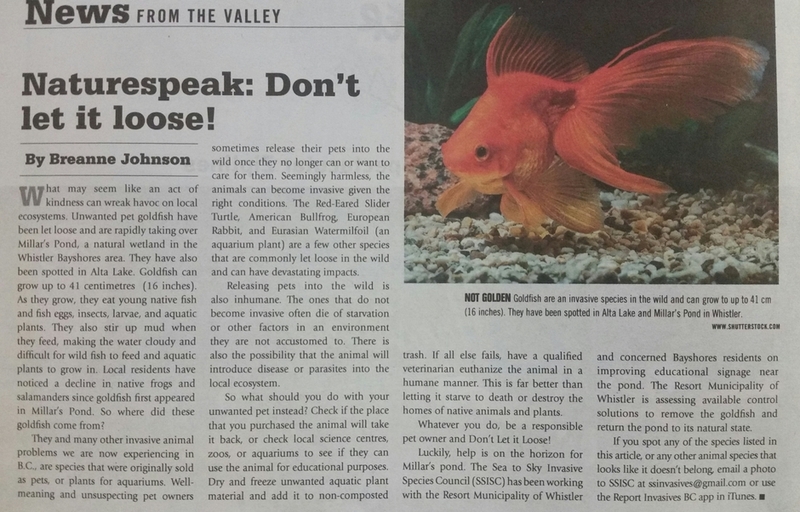 RMOW Working to Remove Goldfish from Alta Lake, Millar’s Pond Read this article by the Pique Newsmagazine’s Brandon Barrett about unwanted pet fish wreaking havoc on the local ecosystem. Naturespeak: Don’t Let it Loose! Invasive Species Month: Have you seen this plant? Learn how to spot Yellow Flag Iris As part of BC’s Invasive Species Month, our own Breanne Johnson writes about how to identify Yellow Flag Iris in this week’s Whistler Question. Invasive Species Month: Have you seen this plant? Learn how to spot Japanese Knotweed As part of BC’s Invasive Species Month, our own Breanne Johnson writes about how to identify Japanese Knotweed in this week’s Whistler Question.